This has come around quickly but it’s time for another Wildest Dreams unboxing. The box actually arrived a little while ago but I’ve been working such long hours at the moment that I haven’t had the chance to take the pictures until this weekend. I’m sure I’m not the only blogger who is struggling to get enough light to take blog pictures at the moment but it certainly is annoying! 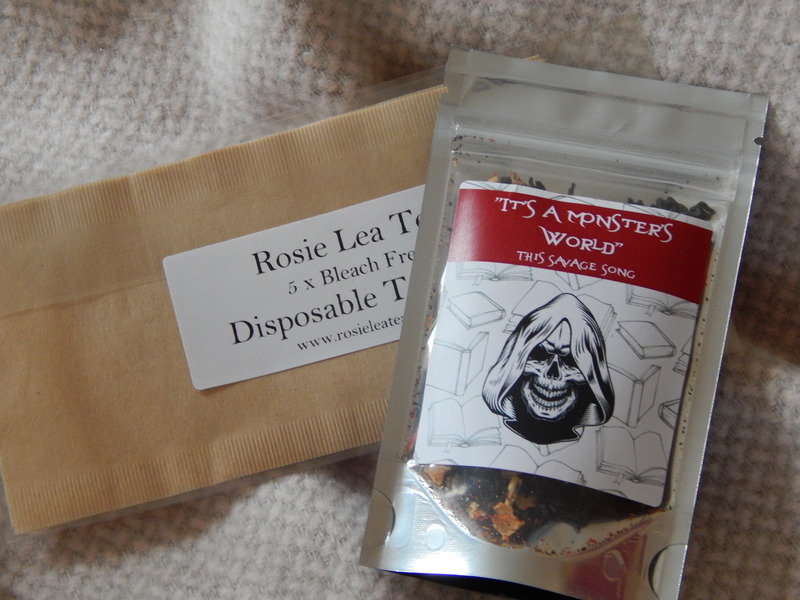 October’s theme was ‘We are Monsters’, which promised a spooky selection of goodies just in time for Halloween. What was tucked away inside that little brown box certainly didn’t disappoint on that front. If you haven’t opened your box yet and want to keep it a secret, look away now. Spoilers abound beyond the picture. The first thing I saw when I opened this month’s box was a beautiful bath bomb from Pretty Suds. 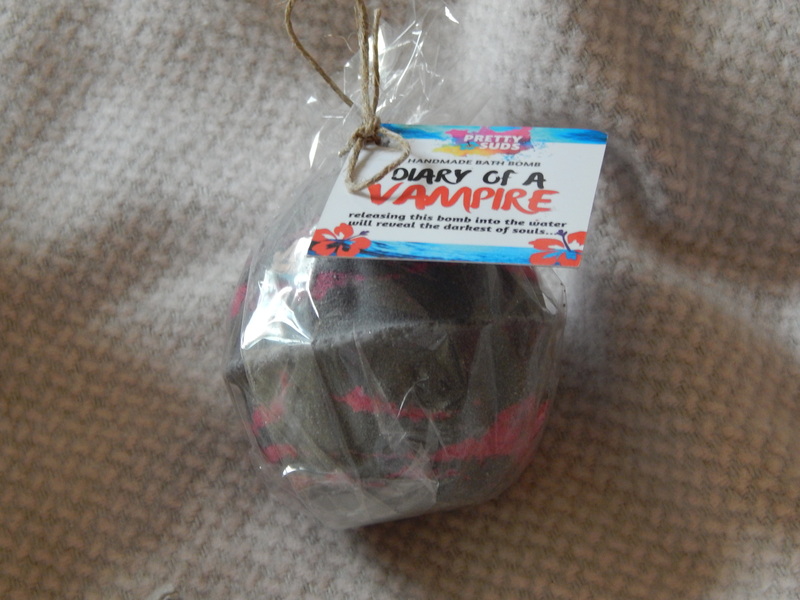 This handmade bath bomb is called ‘Diary of a Vampire’ and smells like vanilla, rose and jasmine. I can’t wait to relax with this after a long day at work with a book in hand! I think this might be my mid-week treat to myself this week. Next, I caught sight of this month’s tea. This is inspired by ‘This Savage Song’ (a book I still haven’t got around to reading) and is called It’s a Monster’s World. The flavour seems a little unusual this month and I’m not entirely sure what I think about it. It’s caramelised pumpkin tea and as someone who has never had a pumpkin spiced latte or anything like it, I’m curious as to what it would actually be like. 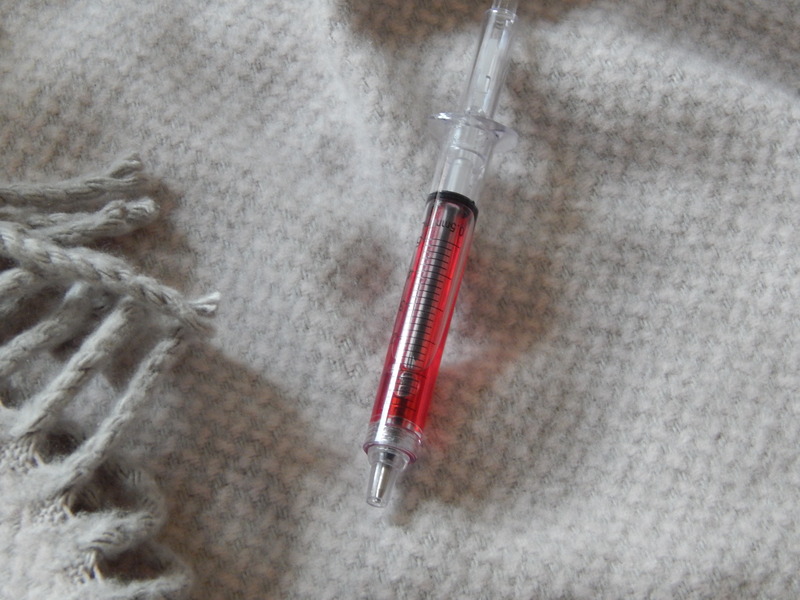 I also seemed to have a spooky syringe pen in my box that wasn’t on the listing but is still pretty cool! Now on to this month’s book! 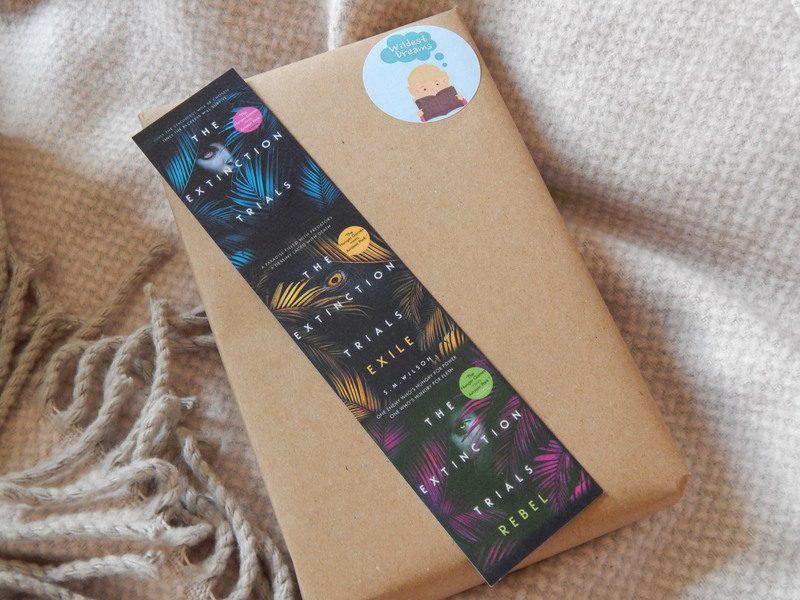 This month’s book has a stunning cover which instantly grabbed my attention and held on to it. It is The Boneless Mercies by April Genevieve Tucholke. 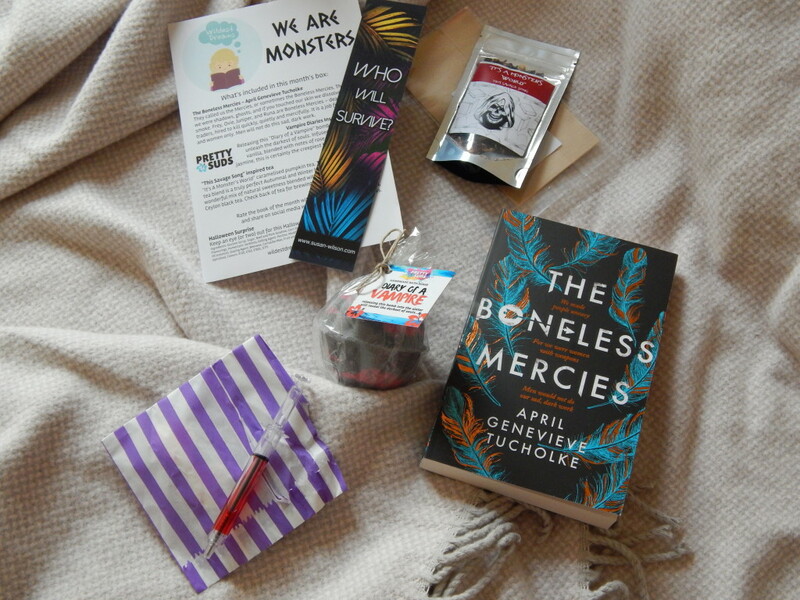 The Boneless Mercies is about women who are hired to kill quickly, quietly and mercifully – an intriguing premise! Do you see what I mean about the book cover? This was such an impressive box and honestly one of my favourite in a while. It was the perfect pick me up in a busy and stressful month! 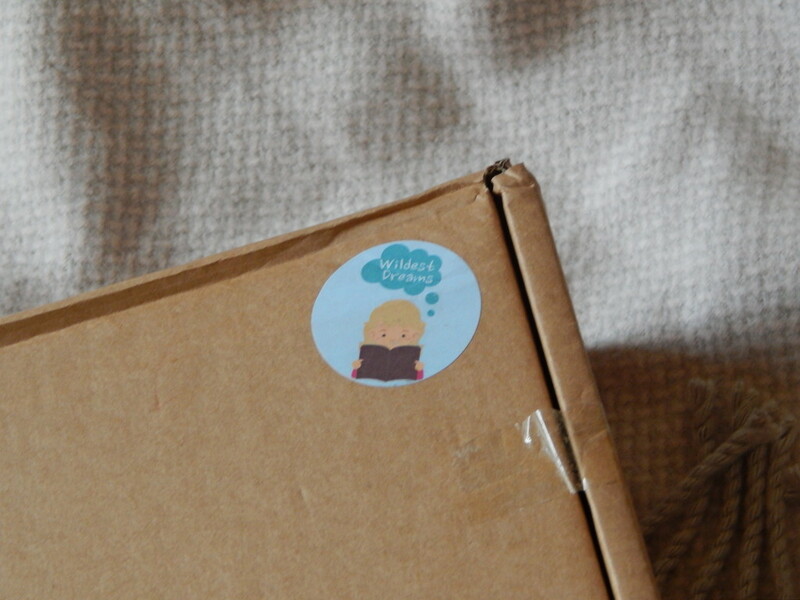 Fabulous unboxing! I think this was one of my absolute favourite Wildest Dreams boxes. I actually *love* the tea, and I’m not even a fan of pumpkin haha. It’s perfectly autumnal. This looks like such a great box. Hope you are looking after yourself amongst all the long hours . I hope you like the tea!!! Tho it does sound super weird. The box I am subscribed to sent chocolate mint black tea and that sounds super weird to me too haha.